Grease a swiss roll tin, then line with rice paper or baking parchment. Put 350g of the cater sugar, glucose syrup and water in a large, heavy pan and heat until the mixture reaches the soft-crack stage (143°C/290°F). Warm the honey in a seperate pan until it just boils, then add to the syrup and bring everything up to 143°C/290°F again. Meanwhile, whisk the egg whites with the remaining 25g sugar until stiff peaks form. Slowly pour the sugar and honey syrup into the whites in a steady stream. Tiny lumps may form, but don’t worry and continue mixing until the mixture is stiff and glossy. Add the warm nuts and orange blossom water and gently fold together. 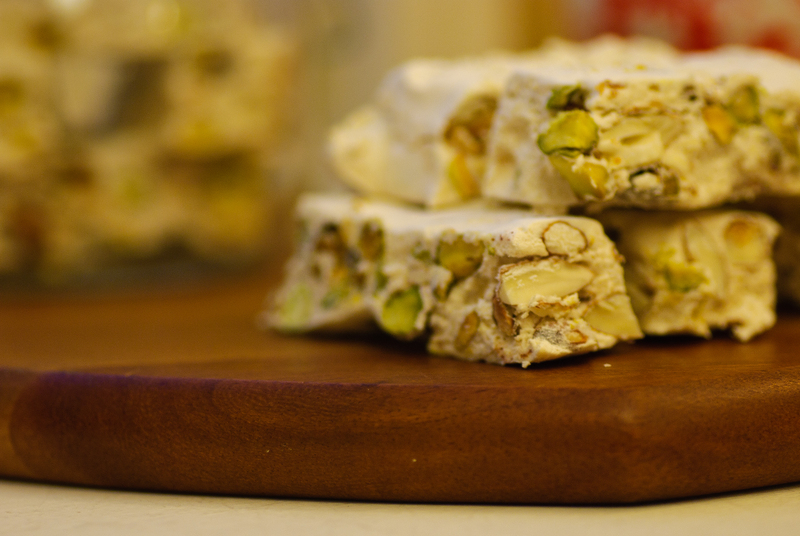 Pour the nougat into the prepared tin. Cover the mixture with more sheets of rice paper or baking parchment and weigh down with a heavy board, such as a chopping board, and weights or dishes. If the chopping board smells strongly of e.g. onions, make sure you put it on a tray or place something between it and the nougat or the nougat will take on the flavour of the onions. Leave to set for about 4 hours. Remove the weghts and board, turn out on to a chopping board and trim the sides to neaten them. Slice into bars or squares and serve. Store in an airtight container for about a week. Amazing photos – I could almost eat the screen… 🙂 Wonderful recipe too – I shall have to try these. We lived in Spain for 12 years and this is close to a favorite Christmas treat there. thanks for the recipe! Your blog is fun and your food photography is GORGEOUS!! Seriously. It’s beautiful work. Thank you! 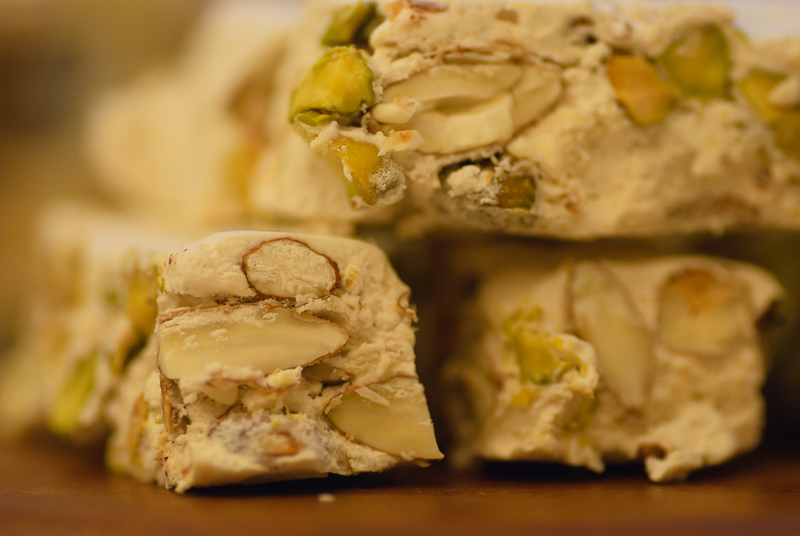 Nougat is one of my favourite things – and this looks amazing! I’m going to have to give it a go soon. Thanks so much for visiting my blog!! I am madly in love with the recipes you have. I love, love, love nougat, marshmallows, Turkish delight, etc. Thank you! Ok will so need to make those they look sooooooooooo good , nice blog !! These look delicious! And so different and creative! Can’t wait to try them. My kids were just asking me how to make this. I may have to give it a go! Will let you know. My kids are older, though I think they were just interested in me making it, lol! 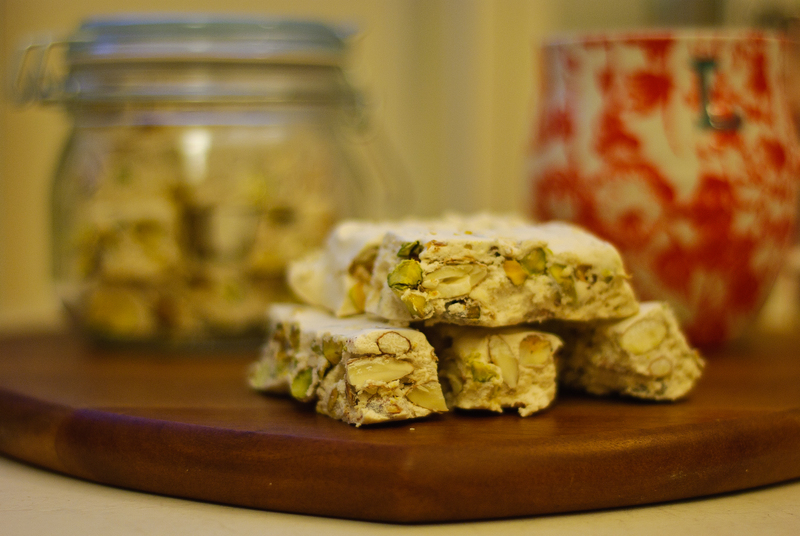 Pistachios are my new found love, so I’m going to have to try this! Hi there Lucy – thanks so much for liking my post – my first baking one, so I feel very honoured! And it’s lovely to get one from a Scot – my grandparents came here from Scotland, and I recognise in you the scottish gifting for the great afternoon tea! 🙂 I’ll enjoy making my way through your posts and trying out new things here. Thanks for visiting. I absolutely love nougat! Gorgeous photography, too! Thanks for visiting my blog and for the like on my post “Homemade Wheat Bread”! Looks so delicious! Any ideas what I could substitute for the orange blossom water? I’m going to try it with egg replacer and agave to see if I can veganize it. Usually I can, but every once in a while a recipe stumps me.